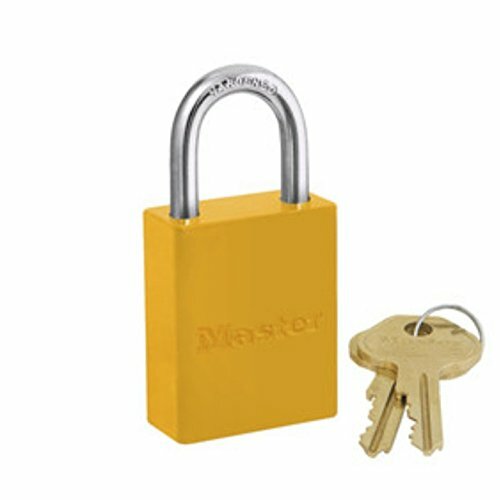 Master Lock Safety Series Padlocks are ideal for corrosive and tough environments. The high visibility color and baked on powder-coated finish provide high security. 5-pin tumbler cylinder is keyed different. 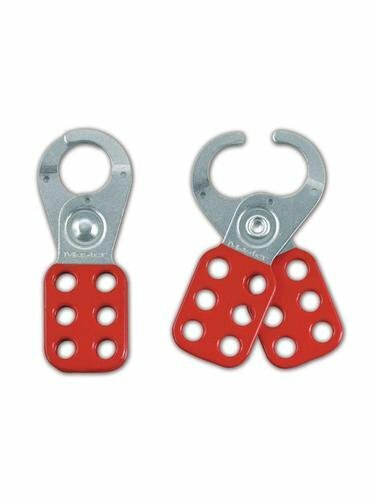 1-1/2-inch wide body and 1/4-inch shackle diameter with 1-inch clearance. 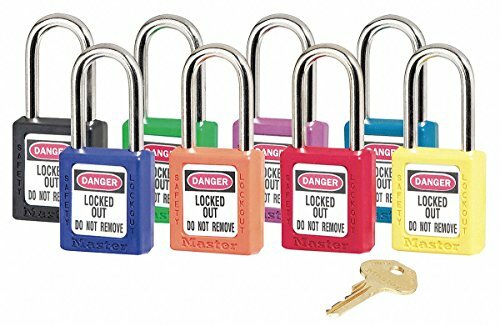 Rainbow Pack with 8 assorted color locks is OSHA compliant with "one employee, one key" directive. 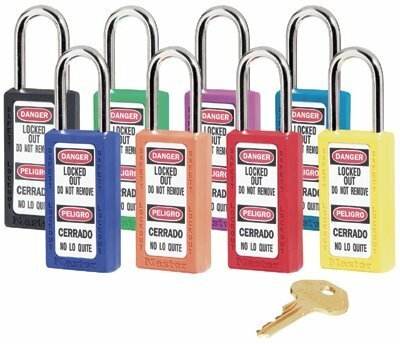 Master Lock Zenex safety padlocks are great for lockout & tagout applications. Durable and lightweight Zenex lock body is non-conductive. Made using a 1-1/2"W Zenex body with 1-1/2" shackle clearance. 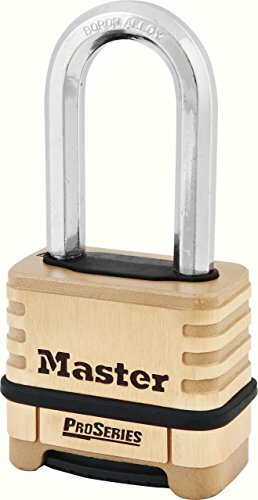 Includes a high security safety cylinder lock with key; keyed different. Note: Keys cannot be duplicated. Red lockout color identifies the safety lockout application. 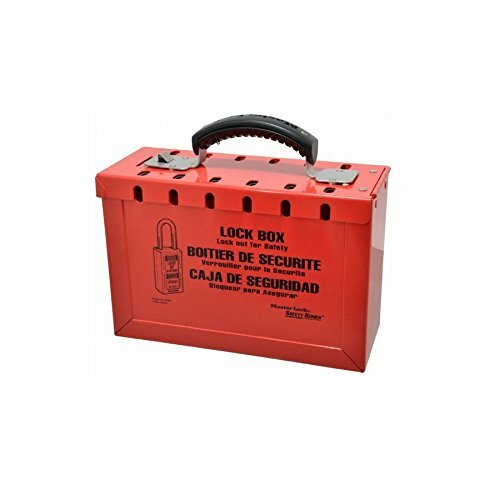 Effective alternative to requiring each authorized lockout team member to place one of their personal safety locks at every lockout point in the system. Up to 13 workers can apply their personal safety locks. 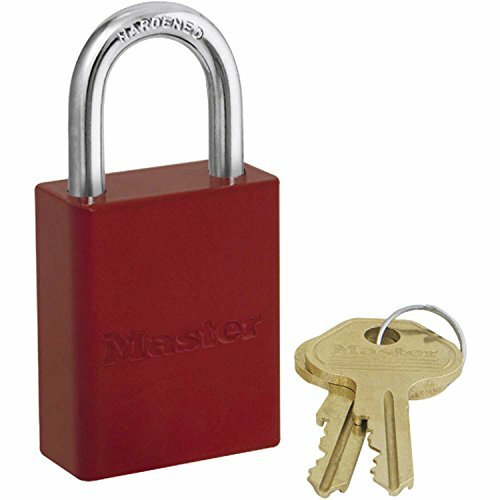 Master Lock Pro Series R.
Made of heavy stamped steel, Master Lock Safety Series ML420 steel lockout hasp features thick red plastic coating for high visibility. 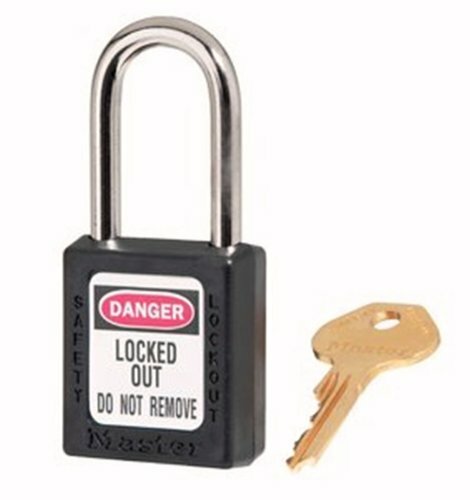 The lockout hasp allows for lockout of the same piece of equipment by up to 6 workers. 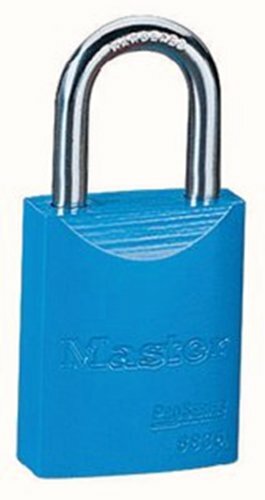 The 1" jaw accommodates padlocks up to 6-3/8", including the ML411RED and ML411BLU safety lockout padlocks. Tamper-resistant scissor-style means security and durability.